Ask fellow campers about "Coachlight Inn & RV Park" and nearby attractions. We have a big rig and this is definitely a big rig friendly park. We stayed two nights. Easy on and off with all pull through sites. There are permanent residents here but they appear to all work during the day and was quiet at night. The folks at the front desk were friendly. Rate reflects PA rates. Utilities worked well. They are on an elevated median which means uphill for your sewer. The water was also low to the ground but usable but I had to dig through weeds to access it. It appeared none of the utility medians had been mowed in quite a while. Good water pressure. Did not use the bathrooms, wifi or laundry. This park is a good place for overnight or a few days. If you need ambiance and amenities this is not the place for you. We camped at Coachlight Inn & RV Park in a Motorhome. We ate at La Posta. It was excellent. This park has terrible curb appeal and many people might be put off by the run down motel in front but the RV Park behind it was actually ok. The people were really nice, the sites were large, and it was very quiet the night we were there. Would only stay for a quick overnight, but it worked for us. We camped at Coachlight Inn & RV Park in a Fifth Wheel. Dusty park next to motel. Nearly empty at the time we stayed. Friendly check-in staff, but patience is required. Sites are wide and access roads are easy to navigate. Location is just off freeway. If your motorhome is shorter than 40', you can probably get away without disconnecting. Otherwise, plan to disconnect your tow vehicle. For fifth wheel, only the shortest could avoid disconnecting. However, sites are wide enough so you can park next to your RV. Biggest concerns were sewer connections above curb level, water connection very close to the ground, and stray dogs wandering throughout park (don't leave your shoes outside or they may disappear). Highway noise was minimal. Price reflects Passport America. City tax brings total nightly rate to just under $25. Not a destination type of park, but decent for an overnight stay. Given no other option, we would return. We camped at Coachlight Inn & RV Park in a Motorhome. Caliche's Frozen Custard is delicious and has 2 locations nearby. Cracker Barrel is one exit east just off I-10 as well. This is a convenient stop over campground and nothing more. It may be under new ownership as there were few people at the motel and it looked like upgrades were in progress. It was hardly with the price of $18 2 years ago but not it's up to $25 with Passport America. Half the park is full timers and about 8-10 sites are suitable for larger rigs. No shade. We will not stay here again in our Big Rig motorhome. We camped at Coachlight Inn & RV Park in a Motorhome. I don't know where to start. The positives of this park are that it's very easy off/on the freeway, sites are pull through and mostly level. When we checked in, Rick the manager, overcharged us at $25 a night after the Passport America discount ($50 for 2 nights), when it was supposed to be $18 a night. He said the price just went up to $25. He was a bit passive aggressive so I didn't argue the price. We later heard him reduce it to $20 a night cash for 2 other couples because they complained to him. Grrrrr! This place is a major dump. The motel was rundown, the pool area was all closed down so looked nothing like the pics on the Passport America site. They claim to have showers and when we asked where they were he reluctantly gave us a key to the men's only and pointed out that it was on the back side of part of the motel building. He said that the woman's tub looked terrible because it was stained, messed up, etc. and suggested that we both use the men's. He then said, "When you unlock it to go in, just yell 'anyone in here?' before you go in." When we went to look at it we were mortified! It was a disgusting old rundown motel room and once we realized that it wasn't safe to use, due to multiple keys given out, we returned the key and showered in our rig. There were mostly resident RVs here and we felt creeped out while staying at this park. I would NOT recommend it and we'd boondock before we'd stay here again. We were in the first row, I think #5. We camped at Coachlight Inn & RV Park in a Motorhome. We did discover a wonderful hike at Dripping Springs Natural Area. We highly recommend it. We also enjoyed the little town of Mesilla, NM which was nearby. Thank you for staying at the Coachlight Inn & RV park. I am so very sorry to hear of your experience. As of August 9, 2017 we are under new ownership and new management. If you will give us another try we hope that you will see the motel has cleaned up and we are remodeling. Our RV park will soon have gravel throughout the park, our pool is being remodeled for a new spring opening and most important of all we will NEVER charge you more than the advertised rate. Again our deepest apologies and we sincerely hope that you will give us a second chance. Only good for one night. It's basically a dusty parking lot with some sketchy residents. There is a cafe at the entrance that served passable food. We camped at Coachlight Inn & RV Park in a Fifth Wheel. Park is located behind an old motel and has many full time rigs, at least many appear to have not been moved for years. Rate shown is after PA discount and online rate was supposed to be $18.50. 50 amp receptacle was broken with connection sticking out and would have been very easy to get shocked as breaker was on when I opened the panel. Someone came into old 60's era class C beside us at 3 am and started hammering. This continued until after 4am when they left. Rig was covered with blue tarps. We camped at Coachlight Inn & RV Park in a Fifth Wheel. Disappointed that we were charged $25 (cash) and Passport America quoted $18 ☹️ This park had a lot of full time residents. We did not look at the laundry, pool or showers. There was a distinct odor that we smelt later in the evening also. Sewer was all taped up, not serviceable. 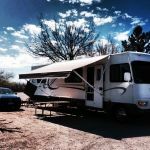 We camped at Coachlight Inn & RV Park in a Fifth Wheel. Substantial price increase since I came thru last spring. It looks like the motel portion might be closed as there is only 1 car parked where the rooms are. The sites are all level and the utilities work well. Some noise from I-10. We camped at Coachlight Inn & RV Park in a Motorhome. 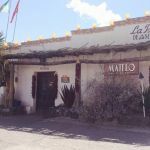 Famous Mexican restaurant in Old Mesilla since 1939 named La Posta de Messila close by the rv park which is beside the motel. We have styaed here two or three times before because it is a good rate for 'traveling through' without having to unhook our tow vehicle. Not the best part of town but when we close our shades, we are home. I called a week prior to our arrival for a reservation, giving them our motorhome length, tow vehicle and full hook up request. When we arrived, we were told that by the reception person that he had just arrived at work, he was not sure about exact site, but he was sure one was available. Well there was not. Rude and poor service. We will not go back. We camped at Coachlight Inn & RV Park in a Motorhome. I was placed in the area they call dry camping. I had electricity but could not connect to water as faucet was too close to the ground. The other campers here are scary, playing loud music. When I saw the other campers my gut told me to move on but I was too tired. But now I know I won't get any sleep tonight. I don't know what the RV park is like but I would definitely say DO NOT stay in the dry camping area!! We camped at Coachlight Inn & RV Park in a Motorhome. As of August 9, 2017 we are under new ownership & new management. So very sorry to hear about your bad experience here. You should NEVER have been placed in a dry spot, that was just wrong on previous staffs part. 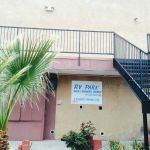 We no longer have undesirable people staying in the motel, we are in the process of major remodel upon motel pool & rooms, some to the RV are but mainly the rv shower area. I do hope you will give us a second chance. RV park is behind an old somewhat rundown motel. It is an open gravel lot with multiple sites. All are pull full and pretty long (we did not have to unhitch). Electric and water worked fine. The showers are an old dingy motel room and could really use some sprucing up. Lots of full time folks living here as well. But a good one night stop when traveling. Four or 5 other rigs pulled in for the night as well. momdoc. We camped at Coachlight Inn & RV Park in a Motorhome. Really nice park. Easy access from I-10. Convenient to Las Cruces sightseeing. All pull thru sites. FHUs. Excellent 50 amp service. Picnic table at each site. Gravel roads and sites. Roads easy to maneuver. Friendly staff. Price reflects nightly PPA Rate. 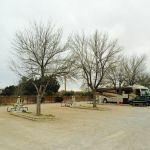 We camped at Coachlight Inn & RV Park in a Fifth Wheel. Flat, clean area with trees and full hookups. Price reflects Passport America. Restaurant closed 3pm but good Mexican close by. Quiet. Fenced. Good for overnight. We camped at Coachlight Inn & RV Park in a Travel Trailer. Behind a rather unkempt motel but rv area was ok. Good value at discount but not at regular price. This is small RV park behind a motel. Easy on and off the highway. Fine for an overnight stay but as others have mentioned the bathrooms and laundry should be avoided. Pull through sites with 50 amp power. No problems with the power. Only a few sites are big rig friendly. When making a reservation make sure you ask for a large site. We probably will not stay here again in our motorhome because it just didn't feel safe. We camped at Coachlight Inn & RV Park in a Motorhome. Our deepest apologies for your experience here at the Coachlight Inn & RV park. As of August 9, 2017 we are under new ownership and new management. The laundry and showers are soon to be remodeled. The rooms in the hotel and the pool area are currently being remodeled. There are no longer undesirable people living on the property, no drugs etc. We are now a family friendly stop. By spring there will even be a play area for children and a specified pet area. We sincerely hope that you will give us a second chance. There's a propane dealer about 1.5 miles north at the intersection with Bus.70, appear to be the only one around, but the price was OK, $2.30/gal. They can fill portable tanks or motorhomes. Convenient for a day trip to Alamogordo's NM Museum of Space History, and White Sands Natl Monument is a must-see. Wine and pizza at Luna Rossa is a good choice & close-by after a day drive. Close to historic Mesilla. We walked to church 2 miles away. Restaurant at entrance but didn't visit, but recommended by office. A big RV dealer and repair one exit down with a store. Old Mesilla town. Double Eagle restaurant. Check out Las Cruces and travel about 50 minutes to White Sands National Park. In Old Mesilla, The La Posta restaurant has been in operation since 1939, and the food and interior make it a worthwhile stop. Pilot and Shell close and motorhome friendly. Good restaurants close by in Old Mesilla. Didn't leave campground but Pizza Hut did deliver a pizza here. There is nothing within walking distance to the park, but Las Cruces is a nice town to visit. Historic Mesilla is just a few miles away and the downtown farmers market was easily accessible. Walmart less than 5 miles away as is the University. Are you affiliated with Coachlight Inn & RV Park ?